Mount Hood is a dormant volcano, called Wy'east by the Multnomah tribe. It is in the U.S. state of Oregon, about 50 miles (80 kilometers) southeast of Portland. It is described as a "potentially active" stratovolcano. The volcano is 11,249 feet high. It is the highest point in Oregon. There are several ski resorts on Mount Hood. There are 12 glaciers. Each year, runners race on foot between Mount Hood and the Pacific Ocean in the "Hood to Coast Relay." Timberline Lodge is a National Historic Landmark located on the southern flank of Mount Hood just below Palmer Glacier, with an elevation of about 6,000 feet (1,800 m). The mountain has six ski areas: Timberline, Mount Hood Meadows, Ski Bowl, Cooper Spur, Snow Bunny, and Summit. They total over 4,600 acres (7.2 sq mi; 19 km2) of skiable terrain; Timberline offers the only year-round lift-served skiing in North America. Mount Hood is within the Mount Hood National Forest, which comprises 1,067,043 acres (1,667 sq mi; 4,318 km2) of land, including four designated wilderness areas that total 314,078 acres (491 sq mi; 1,271 km2), and more than 1,200 miles (1,900 km) of hiking trails. The most northwestern pass around the mountain is called Lolo Pass. Native Americans crossed the pass while traveling between the Willamette Valley and Celilo Falls. Mt. Hood as seen from Timothy Lake. 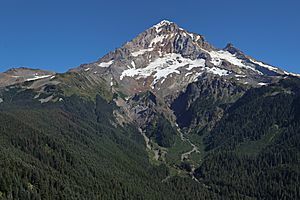 The Multnomah name for Mount Hood was Wy'east. In one version of the legend, the two sons of the Great Spirit Sahale fell in love with the beautiful maiden Loowit, who could not decide which to choose. The two braves, Wy'east and Pahto, burned forests and villages in their battle over her. Sahale became enraged and smote the three lovers. Seeing what he had done, he erected three mountain peaks to mark where each fell. He made beautiful Mount St. Helens for Loowit, proud and erect Mount Hood for Wy'east, and the somber Mount Adams for the mourning Pahto. There are other versions of the legend. In another telling, Wy'east (Hood) battles Pahto (Adams) for the fair La-wa-la-clough (St. Helens). Or again Wy'east, the chief of the Multnomah tribe, competed with the chief of the Klickitat tribe. Their great anger led to their transformation into volcanoes. Their battle is said to have destroyed the Bridge of the Gods and thus created the great Cascades Rapids of the Columbia River. The mountain was given its present name on October 29, 1792, by Lt. William Broughton, a member of Captain George Vancouver's exploration expedition. Lt. Broughton observed its peak while at Belle Vue Point of what is now called Sauvie Island during his travels up the Columbia River, writing, "A very high, snowy mountain now appeared rising beautifully conspicuous in the midst of an extensive tract of low or moderately elevated land [location of today's Vancouver, Washington] lying S 67 E., and seemed to announce a termination to the river." Lt. Broughton named the mountain after Samuel Hood, 1st Viscount Hood, a British Admiral at the Battle of the Chesapeake. Lewis and Clark spotted the mountain on October 18, 1805. A few days later at what would become The Dalles, Clark wrote, "The pinnacle of the round topped mountain, which we saw a short distance below the banks of the river, is South 43-degrees West of us and about 37 miles (60 km). It is at this time topped with snow. We called this the Falls Mountain, or Timm Mountain." Timm was the native name for Celilo Falls. Clark later noted that it was also Vancouver's Mount Hood. Two French explorers from the Hudson's Bay Company may have traveled into the Dog River area east of Mount Hood in 1818. They reported climbing to a glacier on "Montagne de Neige" (Mountain of Snow), probably Eliot Glacier. There have been two United States Navy ammunition ships named for Mount Hood, despite the mountain's namesake having been an enemy commander. USS Mount Hood (AE-11) was commissioned in July 1944 and was destroyed in November 1944 while at anchor in Manus Naval Base, Admiralty Islands. Her explosive cargo ignited, resulting in 45 confirmed dead, 327 missing and 371 injured. 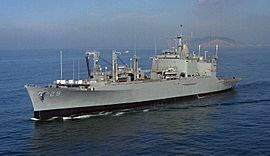 A second ammunition ship, AE-29, was commissioned in May 1971 and decommissioned in August 1999. The glacially eroded summit area consists of several andesitic or dacitic lava domes; Pleistocene collapses produced avalanches and lahars (rapidly moving mudflows) that traveled across the Columbia River to the north. The eroded volcano has had at least four major eruptive periods during the past 15,000 years. The last three eruptions at Mount Hood occurred within the past 1,800 years from vents high on the southwest flank and produced deposits that were distributed primarily to the south and west along the Sandy and Zigzag rivers. The last eruptive period took place around 220 to 170 years ago, when dacitic lava domes, pyroclastic flows and mudflows were produced without major explosive eruptions. The prominent Crater Rock just below the summit is hypothesized to be the remains of one of these now-eroded domes. This period includes the last major eruption of 1781 to 1782 with a slightly more recent episode ending shortly before the arrival of the explorers Lewis and Clark in 1805. The latest minor eruptive event occurred in August 1907. The glaciers on the mountain's upper slopes may be a source of potentially dangerous lahars when the mountain next erupts. There are vents near the summit that are known for emitting gases such as carbon dioxide and sulfur dioxide. 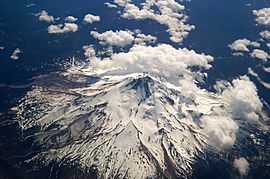 Prior to the 1980 eruption of Mount St. Helens, the only known fatality related to volcanic activity in the Cascades occurred in 1934, when a climber suffocated in oxygen-poor air while exploring ice caves melted by fumaroles in Coalman Glacier on Mount Hood. 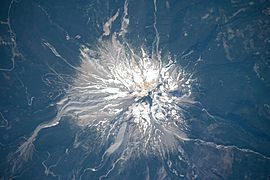 Since 1950, there have been several earthquake swarms each year at Mount Hood, most notably in July 1980 and June 2002. Seismic activity is monitored by the USGS Cascades Volcano Observatory in Vancouver, Washington, which issues weekly updates (and daily updates if significant eruptive activity is occurring at a Cascades volcano). The most recent evidence of volcanic activity at Mount Hood consists of fumaroles near Crater Rock and hot springs on the flanks of the volcano. 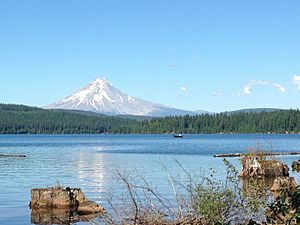 Mount Hood was first seen by European explorers in 1792 and is believed to have maintained a consistent summit elevation, varying by no more than a few feet due to mild seismic activity. Elevation changes since the 1950s are predominantly due to improved survey methods and model refinements of the shape of the Earth (see vertical reference datum). Despite the physical consistency, the estimated elevation of Mount Hood has varied substantially over the years. Early explorers on the Columbia River estimated the elevation to be 10,000 to 12,000 feet (3,000 to 3,700 m). Two people in Thomas J. Dryer's 1854 expedition calculated the elevation to be 18,361 feet (5,596 m) and that the tree line was at about 11,250 feet (3,430 m). Two months later, a Mr. Belden claimed to have climbed the mountain during a hunting trip and determined it to be 19,400 feet (5,900 m) upon which "pores oozed blood, eyes bled, and blood rushed from their ears." Sometime by 1866, Reverend G. H. Atkinson determined it to be 17,600 feet (5,400 m). A Portland engineer used surveying methods from a Portland baseline and calculated a height of between 18,000 and 19,000 feet (5,500 and 5,800 m). Many maps distributed in the late 19th century cited 18,361 feet (5,596 m), though Mitchell's School Atlas gave 14,000 feet (4,300 m) as the correct value. 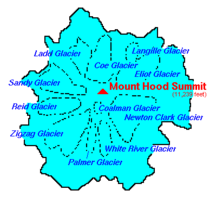 For some time, many references assumed Mount Hood to be the highest point in North America. Modern height surveys also vary, but not by the huge margins seen in the past. A 1993 survey by a scientific party that arrived at the peak's summit with 16 pounds (7.3 kg) of electronic equipment reported a height of 11,240 feet (3,426 m), claimed to be accurate to within 1.25 inches (32 mm). Many modern sources likewise list 11,240 feet (3,426 m) as the height. However, numerous others place the peak's height one foot lower, at 11,239 feet (3,426 m). Finally, a height of 11,249 feet (3,429 m) has also been reported. Eliot Glacier, the largest glacier by volume on the mountain, is below and left of the summit in this view from the northeast. 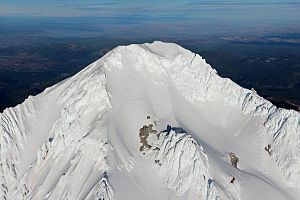 Mount Hood is host to 12 named glaciers or snow fields, the most visited of which is Palmer Glacier, partially within the Timberline Lodge ski area and on the most popular climbing route. The glaciers are almost exclusively above the 6,000-foot (1,800 m) level, which also is about the average tree line elevation on Mount Hood. More than 80 percent of the glacial surface area is above 7,000 feet (2,100 m). The glaciers and permanent snow fields have an area of 3,331 acres (1,348 ha) and contain a volume of about 282,000 acre feet (0.348 km3). Eliot Glacier is the largest glacier by volume at 73,000 acre feet (0.09 km3), and has the thickest depth measured by ice radar at 361 feet (110 m). The largest glacier by surface area is the Coe-Ladd Glacier system at 531 acres (215 ha). Glaciers and snowfields cover about 80 percent of the mountain above the 6,900-foot (2,100 m) level. The glaciers declined by an average of 34 percent from 1907–2004. Glaciers on Mount Hood retreated through the first half of the 20th century, advanced or at least slowed their retreat in the 1960s and 1970s, and have since returned to a pattern of retreat. The neo-glacial maximum extents formed in the early 18th century. During the last major glacial event between 29,000 and 10,000 years ago, glaciers reached down to the 2,600-to-2,300-foot (790 to 700 m) level, a distance of 9.3 miles (15.0 km) from the summit. The retreat released considerable outwash, some of which filled and flattened the upper Hood River Valley near Parkdale and formed Dee Flat. Older glaciation produced moraines near Brightwood and distinctive cuts on the southeast side; they may date to 140,000 years ago. Mount Hood is Oregon's highest point and a prominent landmark visible up to 100 miles (160 km) away. It has convenient access and a minimum of technical climbing challenges. About 10,000 people attempt to climb Mount Hood each year. There are no trails to the summit. Even the "easier" southside climbing route is a technical climb with crevasses, falling rocks, and often inclement weather. Ropes, ice axes, crampons and other technical mountaineering gear are necessary. Peak climbing season is generally from April to mid-June. There are six main routes to approach the mountain with about 30 total variations for summiting. The climbs range in difficulty from class 2 to class 5.9+ (for Acrophobia). 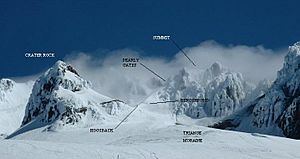 The most popular route, dubbed the south route, begins at Timberline Lodge and proceeds up Palmer Glacier to Crater Rock, the large prominence at the head of the glacier. The route goes east around Crater Rock and crosses Coalman Glacier on the Hogsback, a ridge spanning from Crater Rock to the approach to the summit. The Hogsback terminates at a bergschrund where Coalman Glacier separates from the summit rock headwall, and then to Pearly Gates, a gap in the summit rock formation, then right onto the summit plateau and the summit proper. Technical ice axes, fall protection, and experience are now recommended in order to attempt the left chute variation or Pearly Gates ice chute. The Forest Service is recommending several other route options due to these changes in conditions (e.g. "Old Chute", West Crater Rim, etc.). Mount Hood Facts for Kids. Kiddle Encyclopedia.